This blog entry is about the weirdest aerial accident I have ever read about. I give below the abbreviated version, many details omitted for brevity. But first, background. In the last 100 years Argentina was blessed with a large number of enormously gifted musicians, people who touched the soul of an entire nation. Many were admired both in Argentina and worldwide, but none were admired and loved more than Carlos Gardel. 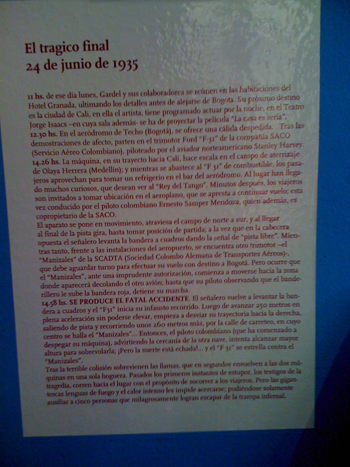 Gardel died in a plane accident on 24 June 1935 at the age of 44, but is still admired today, 77 years later. Some say he actually sings better every passing day. I agree. 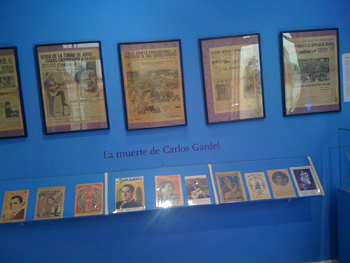 Last week my Spanish teacher Mariela and I visited the Gardel museum in Buenos Aires. A corner of the museum was dedicated to the fatal accident. The text (left) gave the official account of the tragedy, as follows. Gardel’s plane, a three-engine F-31 flying from Bogotá to Cali, made a fueling stop at Medellín, where many admirers have been waiting for hours to see Gardel. After fueling and a photo-op, the plane taxied to the south end of the runway, was cleared for takeoff by a waving of a white flag, and started a takeoff roll into the north (great footage at the bottom). After 250m it suddenly turned right, got off the runway, continued 260m and collided with another plane which was preparing for takeoff, its engines running. The two planes burst into flames, and 16 people including Gardel and the pilots of the two planes have died in the inferno. The official account attributes this to an act of God: a sudden southwest gust of “6-7 Beaufort” (21-33 knots) pushed the F-31 off of the runway, and there was nothing that the pilot could have done to prevent the collision. This account makes sense, plus it takes care of liability issues. Back in the apartment, I googled the accident, and I bring below the alternative explanations. The first evidence that the official account was incorrect is that the F-31’s landing gear tracks indicate that once it turned right it continued in a perfect curve of 30 degrees. Had the pilot tried to correct for the wind, the track would zigzag. Furthermore, some of the tracks disappear several hundred feet before the collision, and then reappear shortly before, indicating that the F-31 pilot had attempted to rotate. The runway elevation in Medellín is 5000’. There are also indications that the F-31 was too heavy even when it landed in Medellín, and probably off of the load-and-balance envelop after fueling and loading additional heavy cargo. There are indications that the F-31 pilot was not proficient in the type of plane and perhaps rotated in ground effect and then stalled. Why would the F-31 pilot turn in the direction of the other plane during takeoff? Aha! There was a huge rivalry and animosity between the two companies operating the two planes, and specifically between the two pilots: Ernesto Samper Mendoza who flew the F-31 Gardel was on, and Hans Ulrich Thom who was the PIC of the other plane, getting ready for departure. Several days before the accident Hans Ulrich Thom humiliated Ernesto Samper Mendoza by buzzing him – flying a few feet over his plane. Perhaps Ernesto Samper Mendoza’s wanted to buzz his nemesis, which would be doubly humiliating because Ernesto Samper Mendoza was also flying a super-celebrity. But wait, it gets even more interesting. In an autopsy of Ernesto Samper Mendoza’s body, a bullet was found in his skull. Where did the bullet come from? Three theories: one is that after the crash Ernesto Samper Mendoza was still alive and shot himself to shorten his suffering. Two is that there was a dispute onboard the F-31 during taking off, and a shot was fired which hit the pilot by mistake causing him to lose control. The third theory is that the shot was fired by the other plane’s pilot, Hans Ulrich Thom, or by his copilot whose body was found with a pistol. We find it laughable that something like this could happen today between, say, Citation and Learjet pilots. Aviation has become safer, if less romantic.